How Hairy are Your Elbows? Hairy Elbow syndrome, they call it. A funny name, perhaps. But if you are the one with the extra elbow hair, it might not be so funny. Sophie has this excess hair, just in the forearm areas around her elbow. Interesting, that a genetic mutation could cause such a specific hair growth. It’s there. So it suggests Weidemann-Steiner syndrome. We will wait many months to learn whether or not this is the name for what our sweet girl carries with her for her time on this earth. It does explain all of her symptoms — nystagums, hypotonia, initial feeding problems, apraxia of speech, small stature, even facial features. It’s all there. Who knew? It’s a very rare syndrome that has only been described since 1989, and was only officially named in 2012, the year Sophie was born. 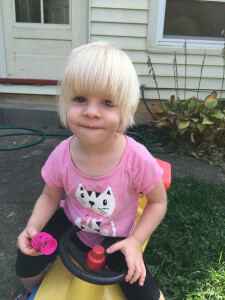 As you can imagine, not a lot is known about this relatively new, rare syndrome, except its defining characteristics, many of which define our sweet girl. Even though some delays remain, the geneticist was very pleased with Sophie’s progress. And he is such a kind man. He enjoyed engaging with Sophie, rather than viewing her just as a case, a mystery to be solved, as some doctors would. We are blessed in the very doctor that God chose for us to see. In addition, this syndrome which he is testing for, as I said, is very rare, yet this doctor has, not one, but, two other patients with this syndrome. In this, I again see the loving hand of the Father, because if this doctor had not experienced this syndrome before, I wonder if he would even have considered it or noticed the characteristics. Our kind doctor called this a sporadic and random genetic mutation, but I know with even more certainty that God chose this for Sophie, for our family. I cannot question his view of reality. I cannot see what is best for my family or my daughter the way the he can. Whether or not she has this certain syndrome, we have walked a different road with Sophie thus far than most parents will walk with their children, and our walk with her into adulthood will continue to be different. Still, I am convinced it is a road that our Father has lovingly chosen for us. I must believe that he sees what is best, even if I don’t understand it. I’m thankful that this syndrome will not threaten to take our child prematurely from our arms. I’m thankful to have my sweet Sophie girl here with me. Perhaps by the first of the year we may have a name for this. And that may help us with insurance and with services down the road. But a name changes nothing. Sophie is who God created her to be, a beautiful, caring child, with a smashing testimony for his goodness and favor. We are blessed to be part of her story. We wait to see how it will next unfold. We wait to see what glimpse of God’s glory Sophie will get to present to her world.